Marvel is pulling out all the stops for the video release of the blockbuster film Avengers: Assembled. In addition to the standard DVD edition, Marvel is releasing special 2-disc and 4-disc Blu-Ray combo packs as well as the 10-disc Marvel Cinematic Universe: Phase One Collection. While this offering looks at first blush to be a ploy to offload excess Blu-Ray inventory, it really is an incredible package. The Marvel Cinematic Universe: Phase One Collection comes packaged in a S.H.I.E.L.D. 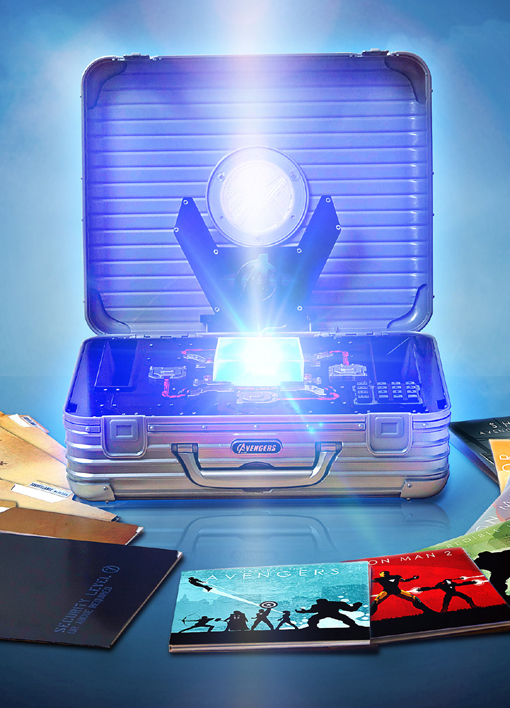 briefcase with a glowing Tesseract and Blu-Ray editions of The Avengers; Captain America: The First Avenger and Thor, as well as Blu-Ray versions of Iron Man; Iron Man 2 and The Incredible Hulk. Plus, the collection includes a top-secret bonus disc filled with never before seen, classified information. It also features exquisitely detailed art, prop reproductions and artifacts from the motion pictures. It is expected that the short film Item 47 will be included in this collection, although it's not specified in the description online. In any case, the substantial price tag seems worthwhile if based only on the movies, the Tesseract, S.H.I.E.L.D. briefcase, and the other extras, so Item 47 would be gravy. The Avengers: Assembled will be released on September 25th and this collection is widely available through participating online retailers and directly through Buena Vista Home Entertainment.